Following a similar style to the other movies, the film starts off with a beautiful and high octane race, but quickly moves from the sunny shores of Spain to the dark, wet roads of London, which becomes the set for the majority of the movie. The plot is pacey and the action is immediate- it feels like a kind of Bond style villain/story but instead of an agent, we have a group of racers. This works in the franchise's advantage in order to be slightly more refreshing and thrilling, moving away from the underground race scene slightly. Reviving Letty and the personal connections she has with Dom really added another layer to the movie and her rivalry with Gina Carano's character also made for some good fight scenes. As the plot heightened and it reached its climax, a red herring of an ending infused disappointment, only for it to explode into the real climax, the finale chase sequence was literally explosive and very intense, though slightly dragged on and unbelievable. This is evident throughout the movie- there is an element of superhuman-ness to these people and whilst it is extreme, it somehow works for this franchise. What also works is that there are many instances I went 'ouchhh' at how some characters are treated in the slick action/fight scenes. Given that extra scene, it was pretty obvious the team were keen to make a 7th (and I hear it is already in talks and in pre-production), which looks to be promising with this additional character who fits right into the genre. Also stars Tyrese Gibson, Ludacris, Elsa Pataky and Gina Carano. The cast does not stand out much in terms of acting ability- it is all very standard and action based- physically all good, although Dwayne Johnson's immensely huge biceps were distracting- you could fit a grown child in there! Michelle Rodriguez was nice to watch though she is pretty type cast in this sort of strong female role. 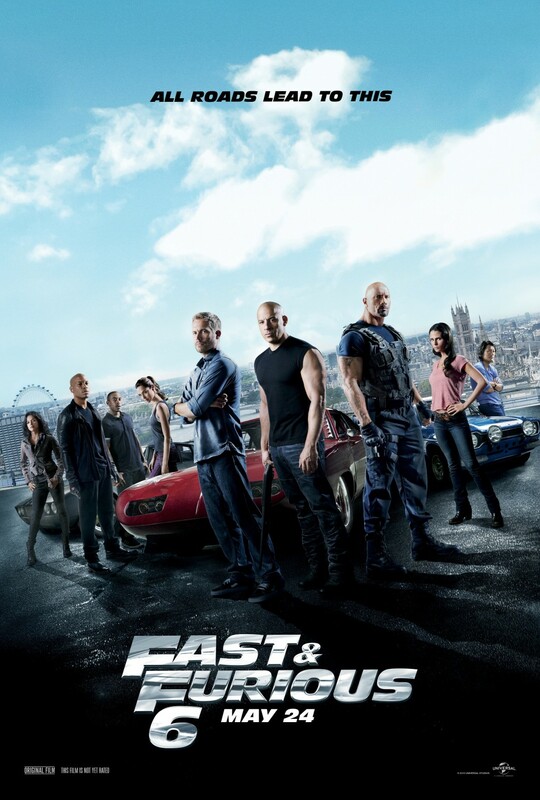 Fast 6 was surprisingly decent given my indifference to the franchise. As a movie, it offered high octane thrills and good visuals, a few twists and an explosive finale - Whilst it won't win any Oscars, it has all the right ingredients for a mindless action thriller.